* No Labels or Identifying Marks. Package in snug crush-proof container if entry is delicate. Edibles must be shelf stable, they will not be refrigerated. 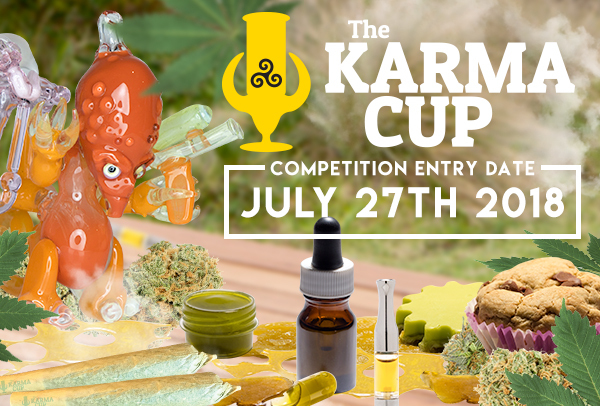 The 5th Annual Karma Cup submission deadline for the 2018 competition year is July 27th 2018. Bud Indica, Bud Hybrid, Bud Sativa, Solvent Extract – Indica, Solvent Extract – Hybrid, Solvent Extract – Sativa, Pre-Roll, Solventless Extract, Distillate, CBD Extract, Cold Extract, Pen / Cartridge, Edible, Topicals. ALL Entries in ALL Categories will be due in our hands July 27th 2018. Entries can be hand delivered ONLY by appointment or mail. Let us know! Use the Official Entry Form to give us full details. Maximum 2 Entries per competitor per category. The Karma Cup is a blind competition. NO Labels or Identifying marks on any entry. We reserve the right to add, delete or combine categories depending on quantity or entries.